(NARRATOR)>> TODAY WE'RE BACK ON PROJECT CREEP IT REAL. WE'RE BUILDING AN EXOCAGE ON OUR JEEP JK, AND WE'RE GETTING OUR FRONT END LIFT INSTALLED. IT'S ALL RIGHT HERE ON XOR. (JEREMY)>> THE FIRST STEP IN BUILDING NEW WHEEL TUBBS IS TO MARK OUT YOUR NEW BIGGER WHEEL OPENING WITH TAPE AND THEN JUST START CUTTING. (JEREMY)>> JEEPS LIKE OURS HAVE AREAS UNDERNEATH THE BODY FILLED WITH FOAM FROM THE FACTORY, AND ONE OF THE PIECES THAT TAKES A LITTLE MORE EFFORT TO REMOVE IS THE PINCH WELD. (ELIZA)>> THIS IS PART OF THE STRUCTURAL PART OF YOUR ROCKER PANEL. 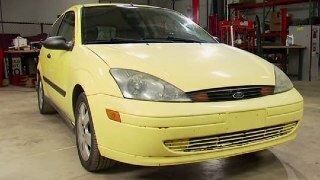 A LOT OF PEOPLE THINK THAT THE OUTER ROCKER PANEL IS DAMAGED WHEN IN FACT IT'S GOT THREE LAYERS. IT'S STAMPED AND SPOT WELDED TOGETHER. SO IT'LL TAKE US A WHILE BUT WE'LL GET THERE. (JEREMY)>> THERE'S OBVIOUSLY ONE DRAWBACK TO CUTTING CLOSE TO ALL THIS FOAM. (ELIZA)>> WOO, FIRE! OH *^#! WOOPS, LOOKS LIKE WE GOT CARRIED AWAY. JUST KIDDING, WE NEED ALL THIS ROOM FOR ALL THE FLEX IN OUR SUSPENSION. (JEREMY)>> AND BACK TO OUR GOOD FRIEND CARDBOARD. WE'RE MAKING TWO PATTERNS. AN INNER TUB AND AN UPPER WHEEL WELL. 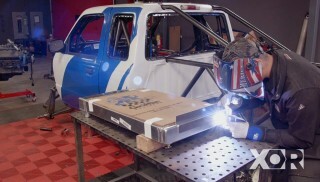 (ELIZA)>> WITH OUR ROCK SLIDERS IN PLACE WE NOW HAVE A GOOD FOUNDATION FOR OUR EXOCAGE, BUT IN ORDER TO WORK ON THE BARS THAT COVER THE FENDER WE NEED TO MOUNT OUR BUMPER SO WE CAN SEE WHERE IT'S GONNA TIE INTO OUR FRAME. READY? (JEREMY)>> LET'S DO IT! FOR THE FRONT AND THE BACK WE'RE USING ARIES TRAIL CRUSHER SERIES BUMPERS. WE'LL MAKE IT LONG. GET THE BACK BACK WHERE IT NEEDS TO BE. 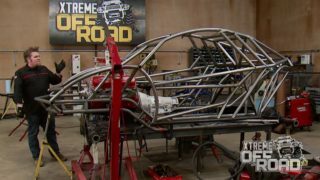 (JEREMY)>> NOW WE ALSO NEED TO PUT THE REAR BUMPER ON AND THE ONLY DIFFERENCE BETWEEN THE FRONT BUMPER IS WE'RE ACTUALLY GONNA WELD DIRECTLY TOO THIS. SO WE'LL HAVE TO PUT IT ON TO MAKE SURE OUR TUBES LAND SOMEWHERE IN THERE. AN EXOCAGE HAS A LOT OF GEOMETRY ON SEVERAL DIFFERENT PLANES. SO WHEN BENDING THE TUBE TO FIT TAKE YOUR TIME AND MAKE SURE TO CHECK THE FIT WITH EVERY BEND YOU MAKE. USING A LEVEL AND AN ANGLE FINDER WILL HELP YOU ACHIEVE THOSE PERFECT BENDS ON THE BIGGER HOOPS. (NARRATOR)>> UP NEXT WE'LL FINISH TACKING OUR EXOCAGE TOGETHER, AND LATER WE'LL GET STARTED ON LIFTING OUR JK. 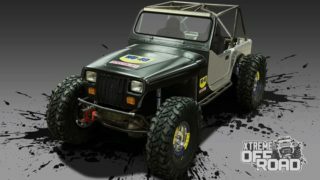 (JEREMY)>> HEY GUYS, WELCOME BACK TO XOR AND OUR EXOCAGE BUILD ON PROJECT "CREEP IT REAL", OUR 2012 JK. ELIZA'S GOT THE MAIN HOOP MOCKED IN PLACE AND WE'RE GONNA BE CHECKING THE FIT OF THE BACK PART OF THE CAGE BEFORE WE TACK IT INTO PLACE. WE'RE UTILIZING THE STOCK ROLL BAR MOUNTS IN THE BACK AS ANCHOR POINTS AS WELL AS CHECKING THE FIT OF THE APILLAR AND WINDSHIELD HOOP. (ELIZA)>> ALL RIGHT, THAT FITS GREAT! SO ALL WE'VE GOT TO DO NOW IS GET IT GUSSETED, AND BRACED, AND CONTINUE WORKING ON THE ROLL CAGE. (JEREMY)>> WE'RE ADDING A SUPPORT BETWEEN THE MAIN HOOP AND THE REAR BARS. THIS PIECE WILL ALLOW US TO TIE THE INNER CAGE TO THE EXOCAGE. (JEREMY)>> AND TO KEEP OUR CAGE FROM MOVING FROM SIDE TO SIDE WE'RE ADDING THE TAILGATE BAR. (JEREMY)>> AND THE LAST PIECE OF THE PUZZLE IS THIS CROSS BRACE THAT THE SPARE TIRE MOUNT WILL BE WELDED TO. (ELIZA)>> MONSTER, MONSTER OF A TIRE. (JEREMY)>> THAT SHOULD SIT JUST LIKE THAT. (ELIZA)>> ALL RIGHT, WELL IT'S ALL TACKED TOGETHER. NOW THE FUN BEGINS. WE NEED TO DISASSEMBLE IT, CLEAN IT, COAT IT, AND GET IT ALL BURNT IN. (JEREMY)>> IF YOU HAVE A LEAKING INTAKE, HEATER CORE, OR RADIATOR AND YOU JUST DON'T HAVE THE TIME TO FIX IT, THEN BARS LEAKS HAS DESIGNED A COUPLE OF PRODUCTS GEARED TO HELP OUT. FIRST IS THEIR LIQUID ALUMINUM. BARS LEAKS SAYS IT WILL SAFELY SEAL LEAKS IN PLASTIC, ALUMINUM AND METAL RADIATORS, HEATER CORES, GASKETS, AND FREEZE PLUGS. IT'S DESIGNED TO WORK WITH ALL TYPES OF CONVENTIONAL AND EXTENDED LIFE COOLANTS. THEIR LIQUID COPPER IS DESIGNED TO DO THE SAME FOR CAST IRON INTAKES, HEADS, AND ENGINE BLOCKS. IT'S ALSO COMPATIBLE WITH ALL TYPES OF 50/50 MIX ANTIFREEZE, AND IT'S A SIMPLE INSTALL. BARS LEAKS SAYS YOU DON'T EVEN HAVE TO DRAIN THE COOLING SYSTEM TO ADD THEIR PRODUCTS. (NARRATOR)>> WHEN WE COME BACK WE'LL GET OUR EXOCAGE COATED AND FULLY BURNED IN, STAY TUNED! (JEREMY)>> THIS, ABOUT 40 PIECES OF CUT, BENT, AND NOTCHED TUBING. NOW ALL WE HAVE TO DO IS GET IT ALL UP IN THE AIR, COAT IT, GET IT BACK ON THE JK. TO COAT OUR EXOCAGE WE'RE USING A PRODUCT CALLED STEEL IT. THIS IS NOT A PAINT BUT RATHER A SPRAYABLE STAINLESS STEEL FINISH. THE PROPRIETARY STAINLESS STEEL IN THIS COATING NOT ONLY MAKES OUR CAGE LOOK GREAT, IT FENDS OFF SUN FADING AND MAKES IT MORE RESISTANT TO RUST, CORROSIVE CHEMICALS, AND FRESH AND SALT WATER. ALSO THE COATING WON'T CHIP OR FLAKE OFF WHEN YOU HIT IT WITH A HIGH PRESSURE WASHER, WHICH OUR JEEP WILL DEFINITELY SEE A LOT OF. PREPPING IS REALLY STRAIGHT FORWARD. WE JUST HIT OUR PARTS WITH 36 GRIT SAND PAPER. THEN FOLLOWED THAT UP WITH A GOOD CLEANING OF ACETONE, ALLOWED IT ALL TO DRY, AND STARTED SPRAYING. AND THERE YOU GO. TOOK ABOUT THREE OR FOUR CANS FOR THE FIRST COAT. SO WE'LL GO GRAB SOME MORE AND START RIGHT BACK ON THE OTHER SIDE, COME RIGHT BACK TO THE END. THEN WE CAN PUT IT ALL ON. BE SURE TO APPLY THE SECOND COAT WITHIN 24 HOURS OF THE FIRST. ONE OF THE GREAT THINGS ABOUT THIS PRODUCT IS WHILE SPRAYING IT, IF YOU GET CARRIED AWAY IT WON'T RUN OR SAG. FOR OUR EXOCAGE WE ENDED UP USING ABOUT SEVEN OR EIGHT CANS OF STEEL IT TO PROVIDE A PROTECTIVE BARRIER THAT WE'RE NOT AFRAID TO BEAT UP. 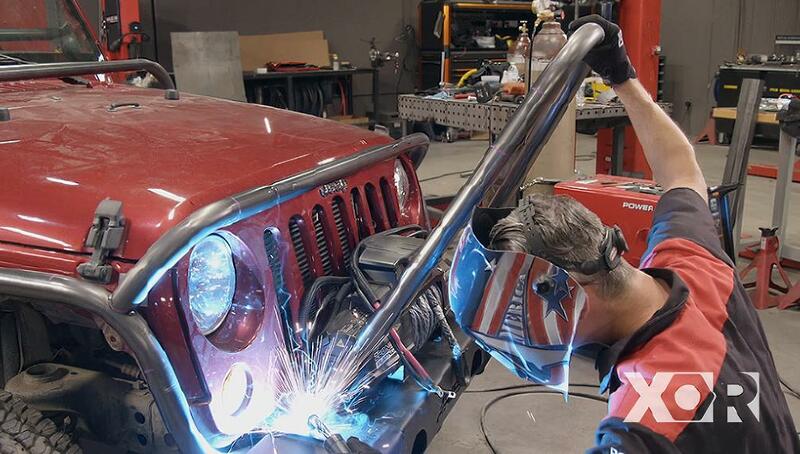 MOST IMPORTANTLY YOU CAN WELD RIGHT THROUGH THIS COATING, AND THAT'S WHY WE CAN SPRAY OUR EXOCAGE PIECES INDIVIDUALLY OFF THE JEEP AND THEN WELD IT ALL RIGHT BACK IN PLACE. ONCE ALL THE WELDING IS DONE YOU WILL NEED TO APPLY A FINISH COAT TO THE WELDED AREAS. HIT THE WELDS WITH 220 GRIT, BLOW THE DUST OFF, AND HIT IT AGAIN FOR A CONSISTENT FINISH ACROSS ALL THE TUBING. IF YOU DO GET A LITTLE CRAZY ON THE TRAILS AND SCRATCH IT UP NO WORRIES. TOUCH UP IS AS SIMPLE AS A LIGHT SCUFF, A QUICK SPRAY, AND YOU END UP WITH A SEAMLESS FINISH. NOW YOU KNOW WE LOVE OUR MATCO TOOLS, AND THEIR POWER TOOLS SURE DO MAKE THINGS GO A LOT EASIER, BUT SOME TIMES YOU NEED GOOD OLE FASHIONED MUSCLE POWER TO GET THOSE NUTS AND BOLT BROKE FREE. SO THIS IS MATCO'S HALF INCH LOCKING FLEX RATCHET. THIS RATCHET MEASURES IN AT 30 INCHES TO GIVE YOU ALL THE LEVERAGE YOU NEED TO BREAK FREE STUBBORN BOLTS, TWEAK SUSPENSIONS, AND TURN OVER STICKY ROTATING ASSEMBLIES. IT HAS AN 80 TOOTH GEAR THAT ONLY TAKES FOUR DEGREES OF ROTATING TO GET THAT NEXT BITE, AND THE LOCKING FLEX HEAD ALLOWS YOU TO PUT THE HANDLE IN PRETTY MUCH ANY POSITION YOU NEED TO GET THE JOB DONE. (NARRATOR)>> AFTER THE BREAK WE'LL GET GOING ON OUR SUSPENSION, STICK AROUND! (JEREMY)>> WELCOME BACK TO XOR. IT'S TIME TO START INSTALLING THE FRONT LIFT ON PROJECT "CREEP IT REAL". AND THAT BEGINS WITH CUTTING OFF THE STOCK LOWER CONTROL ARM MOUNTS. AND FOLLOW THAT UP WITH CUTTING OFF THE UPPER CONTROL ARM MOUNTS. COME ON! WE'VE GOT TO CUT OUR MOUNTS OFF PRETTY CLOSE TO THE FRAME FOR CLEARANCE FOR OUR CONTROL ARM. (JEREMY)>> LIKE THAT. STRONG LIKE BULL. OUR LIFT KIT COMES FROM SYNERGY MANUFACTURING, AND THEIR CONTROL ARM BRACKET MOUNTS TO THE TRANSMISSION CROSS MEMBER AND UTILIZES TWO NUT TABS INSERTED IN THE FRAME FOR MOUNTING. YOU CAN REUSE THE OE CROSS MEMBER BOLTS BUT WE OPTED TO GO WITH NEW GRADE EIGHT HARDWARE FROM INDUSTRIAL DEPOT. 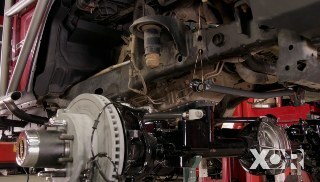 ALSO INCLUDED IN THE SYNERGY KIT ARE BOTH THE UPPER AND LOWER CONTROL ARMS MADE FROM TWO INCH 250 WALL 10-26 DOM TUBING. THE KIT ALSO COMES WITH FRONT AND REAR TRACK BAR AND THE DRAG LINK. SO NOW FOR OUR LOWER CONTROL ARMS WE WANT TO BE ABOUT 31 AND FIVEEIGHTHS CENTER TO CENTER. START WITH THE LOWER CONTROL ARM FIRST. LOCK NUT! THE CONTROL ARMS UTILIZE SOME OF THE OE FASTENERS, AND THE REST ARE PROVIDED BY SYNERGY. WE'LL DO THE UPPERS. AND FOR UPPER CONTROL ARMS WE WANT TO BE ABOUT 25 CENTER TO CENTER, AND THAT'S RIGHT ON. TRICKY PART IS GETTING A NUT BACK THERE. THERE YOU GO. 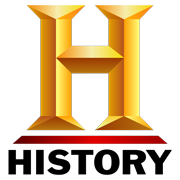 (ELIZA)>> FOR MORE INFORMATION ABOUT ANYTHING YOU'VE SEEN ON TODAY'S SHOW VISIT US AT POWERNATION TV DOT COM. (JEREMY)>> AND LAST BUT NOT LEAST, TRACK BAR. (ELIZA)>> NOW FOR PROJECT "CREEP IT REAL" IT'S OBVIOUS WE NEED A SPARE TIRE CAUSE YOU JUST NEVER KNOW WHAT YOU'RE GONNA ENCOUNTER ON THE TRAIL, AND WITH A SPARE TIRE YOU NEED A SPARE TIRE CARRIER. 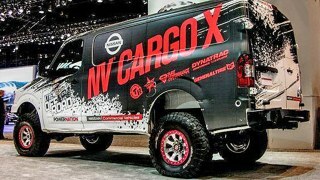 SO FIRST THINGS FIRST, WE'RE GONNA SEE HOW MUCH OUR MAXXIS RAZOR TIRE AND WHEEL COMBO WEIGH. AT 134 POUNDS WE KNOW THAT THIS SPARE TIRE CARRIER, NOT GONNA CUT IT, AND WE NEED TO BUILD SOMETHING A LOT STURDIER. ALL RIGHT, SO WE KNOW OUR TIRE IS 40 INCHES. I'M GONNA MAKE SURE THAT IT'S GONNA FIT IN HERE. WE KNOW THAT WE'VE GOT TO ROUGHLY BE ABOUT AT 23 INCHES IN HEIGHT SO WE CAN FIT EVERYBODY IN. THAT'S 34, OKAY! WITH ALL MEASUREMENTS CHECKED IT WAS OVER TO THE EDWARDS IRON WORKER TO GET A STOCK BENT INTO SHAPE, AND THEN IT WENT STRAIGHT INTO THE TUBE NOTCHER. I'M STARTING WITH TWO SUPPORT TUBES THAT ARE BENT TO 25 DEGREES. 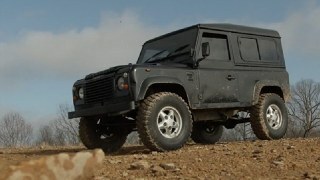 NOT ONLY WILL THEY CARRY THE WEIGHT OF OUR SPARE, THEY ALSO SHIFT THE WEIGHT OF THE TIRE FORWARD AND OVER OUR REAR AXLE. IN ADDITION THESE TUBES WILL RAISE THE SPARE OUT OF THE JEEP'S TUB, GIVING US ROOM FOR MUCH NEEDED TRAIL GEAR. A LEFTOVER UBOLT PLATE I FOUND LAYING AROUND THE SHOP WILL SERVE AS A PLATFORM FOR THE TIRE MOUNT ITSELF. BECAUSE OUR BEAD LOCK HAS A FOUR AND A HALF INCH BACK SPACING WE NEEDED TO COME UP WITH A WAY TO GET OUR SPARE TIRE CARRIER FROM ROUGH STUFF UP AND INTO THE RIM SO WE CAN SECURE IT PROPERLY. SO WHAT WE DID IS WE TOOK THREE INCH STOCK, CUT IT SIX INCHES TO COVER OUR RIM TO THE MOUNTING POINT. NOW ALL WE'VE GOT TO DO IS TACK IT, DO SOME FINAL FITMENT, AND WELD IT ALL IN. (ELIZA)>> THE COOL THING ABOUT THIS EIGHT INCH SPARE TIRE MOUNTING PLATE IS IT HAS HOLE CONFIGURATION FOR SIX DIFFERENT WHEEL PATTERNS COVERING JUST ABOUT ALL THE WHEELS OUT ON THE MARKET. (ELIZA)>> ALL RIGHT, LET'S TEST HER OUT. WELL THERE YOU HAVE IT. NOT ONLY IS THIS OUR SPARE TIRE CARRIER, BUT IT SERVES A SECONDARY PURPOSE. IT PUSHES OUR 134 POUNDS UP AND IN BETWEEN OUR AXLES SO THAT THE VEHICLE IS MORE BALANCED.